Tarot is Intuition on Steroids! Card readings have helped me and many others with, and I am certain can help you as well. Getting Clarity: Sometimes we are so emotionally involved in a situation we can't see anything but the problem. When you are relaxed and centered, you allow Divine Guidance, AKA your intuition, to speak though the cards with only the highest truth. Your intuition is neutral, objective, and non judgmental. Self Improvement: The Tarot can point out areas in your life, or parts of you, that need improvement. Sometimes, it can be difficult when the cards show us a part of ourselves we don't like or are denying, but the only path to growth is awareness. Make Decisions: The Tarot can show you where you are in the present moment and highlight options that may be available to you. Seeing where each direction may lead can help you decide which choice is best for you. The Tarot does not tell you the future; it gives you a probable outcome if you continue on the same path. Peace of Mind: When our Limiting Beliefs keep us trapped in fear, anxiety, and doubt, a Tarot Reading can bring awareness to your present situation, show you where you are headed, and give you an opportunity to change course. Remember awareness of your thoughts creates choice! Over twenty-five years ago, I received a deck of Tarot Cards as a gift from a friend of mine. He knew I was into mysticism, spiritual growth, and self-improvement, so he thought it an appropriate gift. As grateful as I was for this gift, I knew nothing about the Tarot at that time, and I was a busy mom working full -time. So, the cards got put aside in a closet with little more thought. came across the long forgotten Tarot Cards. After my daughter left for college, I started playing around with them. I think I had a case of "empty nest syndrome." I remember that some of the cards scared the daylights out of me, (the Death and Tower cards to be exact). I was only using the book that came with them for interpretations; and my life, at that time, was not the most stable. I was imaging all sorts of gloomy themes. 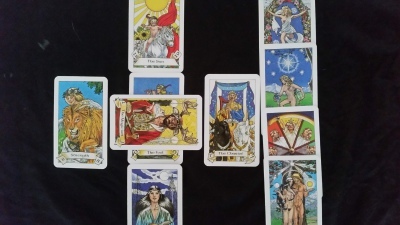 I am happy to say, I couldn't have been more mistaken in my view of the Tarot. I have since learned Divine Guidance speaks through these cards if you listen. The more I used the Tarot Cards, the more I resonated with them. I knew these cards were a fit for me and I wanted to master the skill of reading them. The years went by, and after countless readings for myself and others, the books got put away and my intuition increased. Events, situations, thoughts and problems all brought a Tarot card to mind that was a perfect fit for the matter in question. The more I related them to my life, personalizing them, the easier it became to intuitively understand the cards. I definitely credit using the Tarot as a divination tool, followed by becoming a Reiki Master Healer, the key to awakening my intuition. Things had been very uncertain at my place of employment, but I was under the impression there was a resolution around the corner. I asked Patti to do a Tarot reading for me. Patti's intuitive reading was incredible. She provided me a great deal of detail while making sure I understood and could relate what she was saying to my question. Patti and the cards kept repeating that a resolution was going to take far longer than I anticipated. One year later and I am still waiting on the resolution! Patti's reading brought clarity and insight to my situation. Thank you! !